Washington Post blogger Jennifer Rubin used to hate the Paris climate deal. Then Trump agreed with her. Now she loves it. What changed? Rubin clearly doesn’t mince words in her attack on Trump for planning to pull the U.S. out of a global warming agreement with no binding legal authority and no enforcement mechanisms. What makes Rubin’s attack on Trump so strange, though, is that Rubin herself was a staunch opponent of President Barack Obama’s 2015 climate change deal…right up until Trump opposed it. To see how absurd Rubin’s sudden 180 on the agreement is, it helps to look back at all the horrific things she said about the deal as recently as last year. Just a few months prior to that column, Rubin accused Obama of using the Paris climate deal to distract from his administration’s failure to contain the spread of radical Islamist terrorism across the globe. “The president has no answer, so he goes to Paris to talk about climate change,” Rubin seethed. The same day, she characterized the deal as a “group wish” and “nonsense” because it lacked any enforcement mechanisms. Sen. Inhofe: Paris Climate Deal Devoid of Substance https://t.co/7ky1fFOOAb YUP! And then, just days before then-candidate Trump pledged to his own supporters that he would “cancel” the Paris climate change deal if elected, Rubin counseled Republicans that rather than denying global warming, they should instead “oppose left-wing, ineffective bureaucratic responses” to the problem. Six days later, on May 26, 2016, Trump took Rubin’s advice and vowed to end U.S. participation in the controversial Paris deal. “We’re going to cancel the Paris climate Agreement and stop all payment of U.S. tax dollars to U.N. global warming programs,” Trump pledged, echoing Rubin’s demand that Republican leaders oppose left-wing, ineffective bureaucratic responses to global warming. These are the fruits of mindless anti-Trumpism. Rubin’s whiplash-inducing reversal is evocative of the cheesy old anti-drug campaign featuring an egg being fried in a skillet. 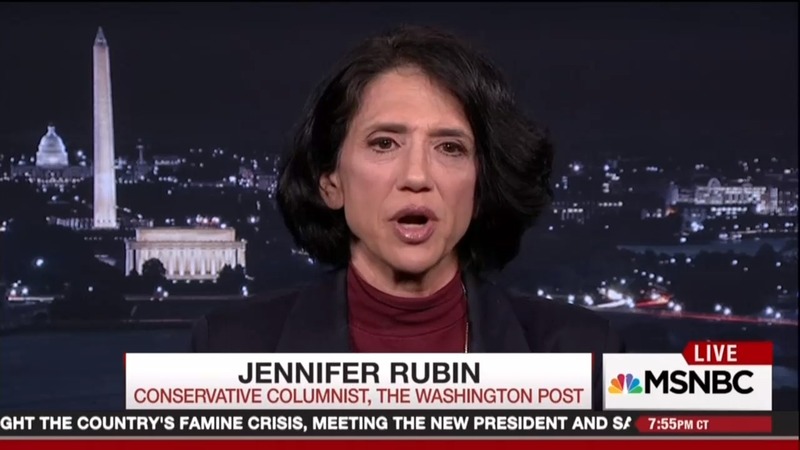 If you want to see what a brain high on bitter anti-Trumpism looks like, look no further than Jennifer Rubin’s latest rants in the Washington Post. Before Trump came along, she hated the Paris deal, for good reason. But as soon as Trump agreed with her, she couldn’t countenance being on the same side of an issue as him. So she magically decided that opposition to the deal made you a knuckle-dragging, science-hating Luddite, all because Trump had the audacity to agree with her. Rather than being an exemplar of thoughtful independence, Rubin is herself a glaring example of how partisanship blinds a person to objective reality, eventually forcing her to stomp all over principled positions she held just days before, and all because somebody she thinks is icky had the temerity to endorse her views. Rubin is proof that if Trumpism corrupts, unhinged anti-Trumpism corrupts absolutely.